Manufacturers are increasing productivity 10-40% and reducing tooling costs by addressing an often overlooked flaw in toolholder-retention knob design. High speed machining in excess of 20,000 RPMs is often utilized in aerospace when machining exotic alloys and harder metals like titanium. At these rates of speed, the precise and secure seating of tapered toolholders in the spindle becomes even more critical. So much so, that failing to pay attention to this single detail can lead to decreased productivity, less precise machining, reduced tool life and even damaged workpieces. However, that is precisely what is occurring in aerospace machining due to an often overlooked, even ignored, link in the chain: poorly designed retention knobs that – when tightened – create a bulge in the small end of the taper that prevents full contact and proper seating in the spindle. Yet despite widespread evidence of uneven wear patterns and simple “touch-off” tests that immediately identify it as a widespread issue, the industry has largely ignored this aspect of machining and, unwittingly, are paying a significant price for it. Although the shank of tapered toolholders is ground to a fine finish within very precise, established tolerances, and are also threaded at the narrow end to accept a retention knob. The knob is designed to engage with the drawbar, which exerts a pull force that holds the toolholder firmly in the spindle. The problem is poorly designed, traditional retention knobs – a less than $30 part – when tightened create a bulge in the taper that prevents proper seating in the spindle. Once this expansion occurs, the toolholder will not pull fully into the spindle and so cannot make contact with upwards of 70% of its surface. The results are manifested in a wide range of CNC milling issues often attributed to other causes: vibration and chatter, poor tolerances, non- repeatability, poor finishes, shortened tool life, excessive spindle wear and tear, run-out, and shallow depths of cuts. To accomplish this, retention knobs are used. However, Ausbun says that newer CNC milling machines exert significantly more drawbar pressure on the knobs than in the past. This is compounded by the fact that most retention knob manufacturers provide little information on the proper torque required, a factor that can lead to the improper seating already described above. As a result, Ausbun says several of the retention knobs literally pulled apart during operations. “As drawbar tension continues to increase in CNC machines, it puts so much pressure on the weakest link, the retention knob, that it’s bound to come apart,” says Ausbun. To find a solution, Ausbun did some online research and found JM Performance Products, Inc. (JMPP). In 2009, the company introduced its High Torque retention knob. Invented by the company’s founder, John Stoneback, the product works with all existing toolholders including BT, DIN, ISO, and CAT toolholders from 30 taper to 60 taper. The High Torque retention knob is longer by design to reach deeper into the threaded bore of the toolholder. As a result, all thread engagement occurs in a region of the toolholder where there is a thicker cross-section of material to resist deformation. It also includes a precision pilot to increase rigidity, and is balanced by design. Since even over-tightening of the High Torque retention knobs can still create a bulge, the company provides specifically calculated torque specs based on drawbar pressure. By combining the High Torque retention knob with the correct torque, spindle contact with the taper is improved to close to 100% every time. After finding out more information about the product, Ausbun says he decided to order a few and give them a try. In addition to having high hopes for the product, he says he was also impressed that JMPP had researched the appropriate torque settings for installing the retention knobs as well. By increasing the rigidity of the toolholder at higher RPMs, the High Torque retention knob can also increase tool life. Perhaps more than some other industries, aerospace manufacturing can take a toll on the carbide cutting tools used when machining exotic alloys and hard metals. The result is that cutting tools must be changed out more frequently as they dull or break. 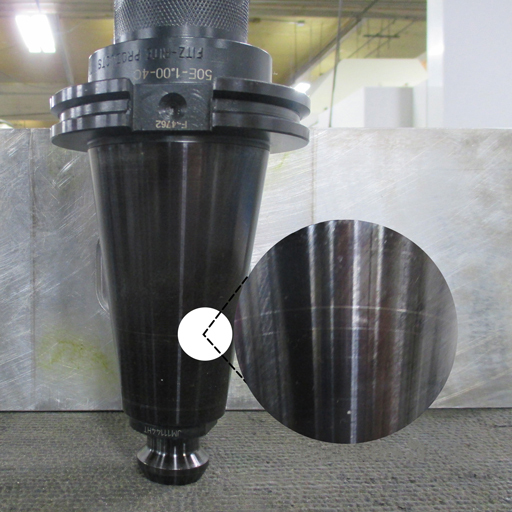 With higher-end technical carbide inserts, the cost of tool replacement, not to mention loss of production time due to frequent changeover, can add up quickly. Ausbun estimates that tool costs have been reduced by as much as 20% as a result. 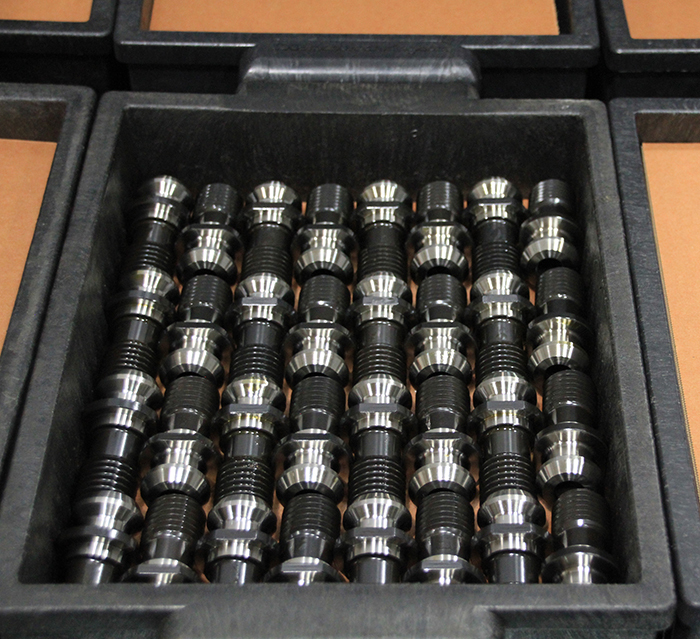 Although manufacturers are already benefitting from implementing the High Torque retention knobs, others remain unaware – even dismissive – that improper seating of tapered toolholders is even a problem. For those that are not entirely convinced, JMPP suggests a simple 6-step “touch off” test (www.jmperformanceproducts.com/toolholder-test.aspx). More sophisticated measurement of toolholder expansion (bulge) can also be taken using a taper shank test fixture.